Earlier today, there was chaos at the Abuja Church as traders who conduct business around the church’s surroundings arrived early in the morning to find their wares have been burnt. The ministry, however, faulted the viral video and report online, which claimed that it was responsible for the ejection and burning of the traders’ valuables. Pastor Victor Stephen, who responded to the report, described it as a malicious propaganda. 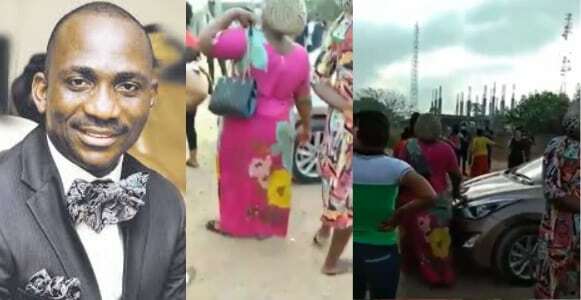 The ministry in a statement this afternoon said its Senior Pastor, Dr. Paul Enenche never ordered anybody to pull down traders’ property as claimed in the video. The statement noted some traders selling outside the Church premises were even empowered by the Church as part of its Corporate Social Responsibility to setup their own businesses and wouldn’t have in turn chase them away as being claimed in the video. My name is Pastor Victor Stephen, Head, Central Admin of Dunamis Int’l Gospel Centre. Our attention has been drawn to a video clip circulating the cyber space concerning Traders’ properties being burnt down by Dunamis Church at the New Headquarters. We wish to state, though with dismay, that the Church, Dunamis was not responsible for that kind of act and can never be. Dunamis is geared towards the restoration of human lives and destinies and can never be associated with such heinous acts to indigent persons. It is also worthy of note that some Traders selling outside the Church Premises were empowered by the Church as part of our Corporate Social Responsibility to setup their own businesses. It would therefore be mischievous for anyone to assume that Dunamis would authorize such an act. Please disregard this malicious propaganda, Dunamis is not responsible.